Panorama has two interfaces for displaying and editing data – the Data Sheet and Forms. A single database only has one data sheet but it may contain many forms. You can design each form for a specific purpose, for example entering data, printing a mailing label, or printing a report. Each form is completely customizable. You can (and in fact must) set up the placement of each item on the form, including data, text and artwork. The form view is much more flexible than the data sheet view, but it is also more work to set up. Forms are created and accessed via the View menu. This menu lists all of the forms in the current database. See Creating a New Form. Note: As you can see above, you can also access Procedures and the Data Sheet thru the View menu. 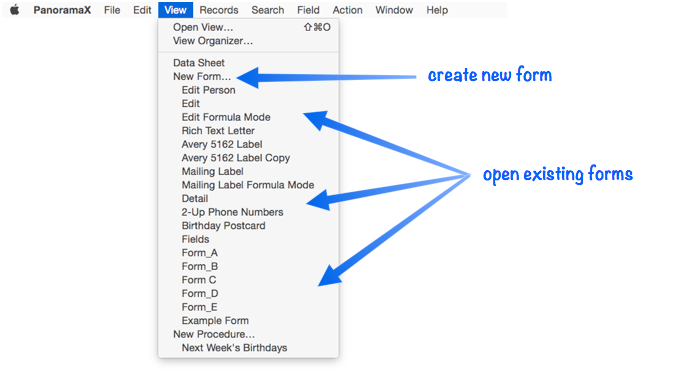 Unlike other views, the Form View operates in two distinct modes – data access and graphic design. Use the T-square tool to toggle between these modes (you can also toggle between modes by pressing the ESC key). Graphic design mode is easily recognized by the rulers that appear at the top and left edges of the windows, and by the properties palette that appears on the right side of the window. Data Access Mode (also called Data Mode) is the default mode. In this mode you can view and display data, and navigate through the database. Graphic Design Mode (also called Graphics Mode) functions like an electronic drafting table. In this mode you design the form by drawing lines, boxes, and other graphic elements. This mode is very similar to many drawing and page layout programs. 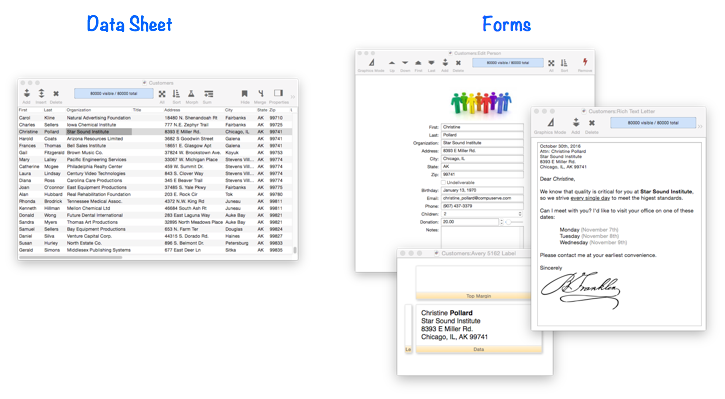 See Graphics Mode to learn more about creating and modifying the layout of a form. Creating a New Form -- creating a new empty form, or a duplicate of an existing form.